Durban, South Africa is a coastal city in eastern South Africa’s KwaZulu-Natal province. 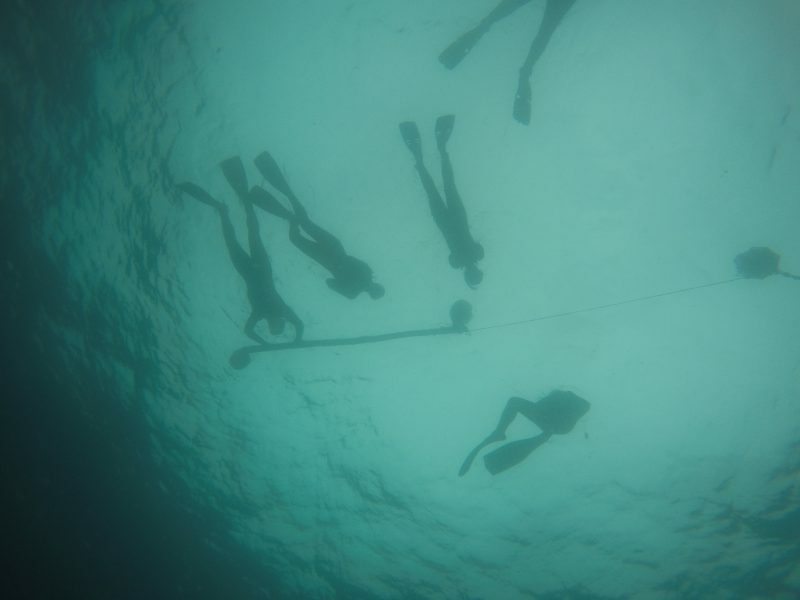 Among Cabin Crew, it is known as a great place to eat, shop and …experience shark cage diving! Don’t get me wrong, I love a nice steak and a walk around the mall, but I’m all about trying new things. That being said, of course, I opted to swim with the fishes! A friend of a friend recommended Blue Wilderness Shark Adventures. At first I was hesitant, not because I was scared, but because I am a big animal lover. There are a lot of places out there that are driven by profits and as a result do not respect the health and wellbeing of the animals they showcase (using unsafe practises that are dangerous to both humans and wildlife). After conducting some research, I found that the purpose of Blue Wilderness is to aid in the conservation of sharks by introducing them to people through education, excitement and empowerment. They are looking to change the negative perceptions of these creatures and foster conservation efforts, which made me feel better about my decision to participate. 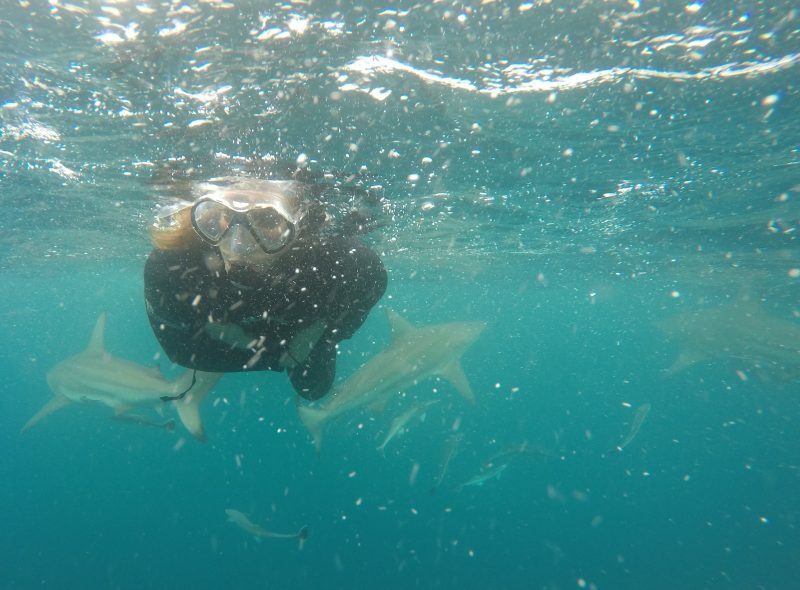 I chose to swim with the sharks without using the cage because I wanted to experience being alongside them without any barriers. To some, swimming without a cage would be considered extremely dangerous, but in reality sharks are harmless! By nature, sharks are intimidated by humans. This is why is often used to lure them in on these excursions. Humans are also not considered food for sharks. The sharks involved in incidents with humans are often hunting for seals or dolphins and mistake people for marine life (given our size and shape). The majority of shark species actually eat fish or invertebrates like squid or clams. In fact, sharks are the real victims. They’re often labeled as dangerous killers that will eat anything that comes their way. In reality, they’re killed by the millions each year for their fins, which has led to overfishing and illegal fishing effecting shark populations worldwide. According to the World Wildlife Fund, there were only three shark-related human deaths in 2014 compared to around 100 million sharks killed annually by people. 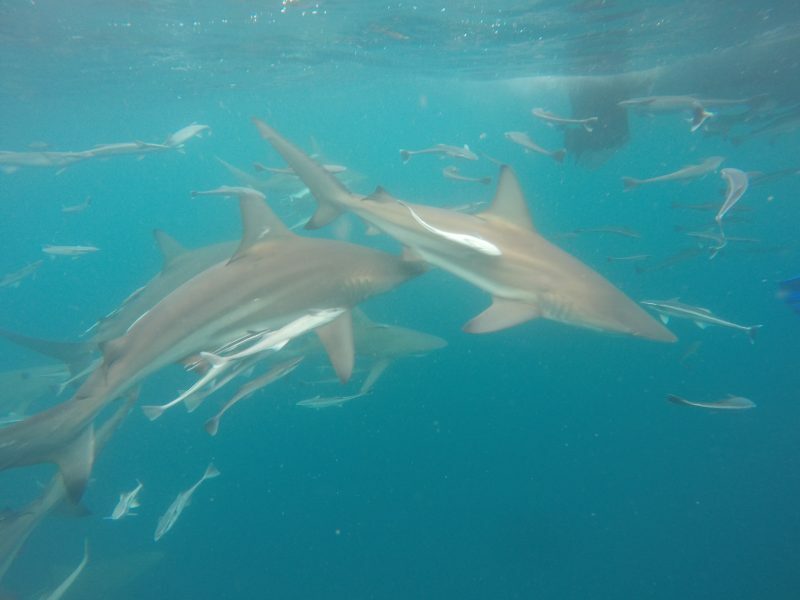 There is still a lot of debate over wether or not shark cage diving is harmful to these animals; largely because of the ways in which these organizations lure sharks in. The process most places use is called “chumming”. It consists of dumping a mixture of water, fish oil, and mashed parts of sardines in the water. This practise is outlawed in some countries (like Australia) because of the recorded significant changes in great white shark behaviour as a result of the practise. There are claims that sharks are learning to associate human presence with the possibility of food, which can potentially increase the risk of shark attacks. On the other side of the argument, according to Dot Earth, there are claims that it is highly unlikely for sharks to associate human presence with food since there is a huge difference (to sharks) between the sight and smell of a research vessel floating on the surface, and a human body being in the water. Previous Post Wishing the United Arab Emirates a happy 45th National Day! What an amazing adventure! Your spirit of wonder is really brave and adventurous! May I ask you, there are no open days in my country of Emirates this month and I have recently read at Emirates webpage that the process of recruitment for cabin crew is gonna change by 2017, including now a video interview before the assessment day, in which it would be the normal process, but first you’ve gotta pass this first step. So I’m quite sad thinking may be it is even more difficult now to get to be cabin crew there! Have you heard anything of this new video test? Thank you in advance and wish you Merry Christmas and all the best in the sky!